Dublin Buffalo Wild Wings location has offered CCYHA an opportunity to earn funds each time our families dine in or do take outs at their restaurant on 6595 Perimeter Dr., Dublin (Avery Square Shopping Center). 1. Bring your Teammate Card into your sponsoring restaurant, during the entire season, August 1, 2016 through March 31, 2017. Details are on your card. 2. Show your card, on a mobile device or via printed copy, to your server and let them know you are part of the CCYHA Home Team Advantage Program. 4. Applicable to dine in and for all take outs. 5. 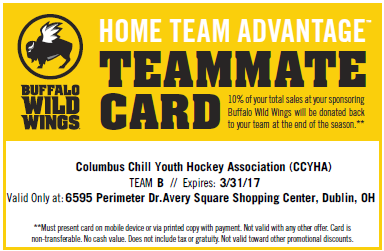 At the end of the season, Buffalo Wild Wings will donate the 10% of sales that CCYHA generated throughout the season back to our organization. 6. Please pass this information to all your friends and families and don’t forget to mention CCYHA every time you eat at BW-3 in Dublin.